Do you suffer from symptoms after eating? Such as digestive symptoms, foggy brain, sinus congestion or aches and pains. Do you notice it after gluten containing foods or just can’t track what’s causing it? Chances are you’re body is reacting to components in plants called lectins. 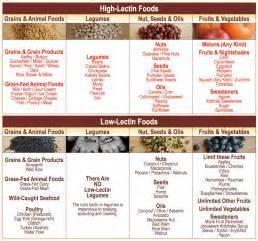 What are lectins? So happy you asked! Lectins are the plants natural compounds to ward off pests, fungal and bacterial attack. That is, the plants natural immune system. When plants are under attack they raise their lectin numbers to fend off the attacking pests. This is the system by which pesticides work. However, pests are gaining tolerance resulting in needing an increase of pesticide to be applied to the plant and thus a further increase of the plants lectins. Our modern wheat strains have been modified to produce more lectins to be highly pest resistant. This very clever genetically engineering won Norman Borlaug a Nobel peace prize in 1970 and changed the industry inexplicably. However, years later we are discovering the health consequences of our daily foods containing such an immense amount of lectins. The modern wheat (Triticum aestivum) is a genetically engineered species containing three distinct sets of chromosomes. These chromosomes can produce over 23,000 unique proteins. Thus this modern species contains high protein and gluten levels plus wheat germ agglutinin (WGA). WGA is a lectin which provides wheat with its resistance to insect pests, yeasts and bacteria. Interestingly WGA binds to N-acetyl D glucosamine in the chitin of the insects, disrupting their cell structures and killing them. Why are lectins so bad? It is this WGA (lectins) which can also directly damage tissues of the human body wherever N-acetyl glucosamine is present, even if the individual doesn’t have any genetic predispositions or susceptibilities to immune mediated mechanisms. For example, the auto-immune conditions or inflammatory reactions. However, the presence of lectins can and do exacerbate inflammation for auto-immune conditions such as Coeliac’s Disease, making symptoms worse. This can explain why chronic inflammatory and degenerative conditions are gaining prevalence in wheat-consuming populations. It destroys the villi in your intestines, leading to malabsorption, nutrient deficiencies and infections! All mucosal membranes throughout the digestive system, respiratory system, etc. Arterial bifurcations, including around the heart. It is proposed that it is the increased lectin content that are causing major health problems for people rather than gluten. For example, many Australians experience health problems after eating products made from Australian grown wheat. Where as if they travel to other countries and consume wheat based products from there they do not, i.e. France or Italy. Such countries grew different strains of wheat which were largely unmodified like our Australian grains. Hence, the end product (croissants, baguettes, pasta, pizza bases) had less lectin resulting in fewer reactions after eating. Of course this has now changed as the high yield strains are now more global. Is it just grains which we get lectins from? Furthermore, when livestock are fed grains high in WGA lectins this then passes through their system to the products we consume. For example, dairy milk. Therefore, if you’re experiencing symptoms after consuming dairy it may not be lactose or actual dairy protein but the lectins passed through the dairy cow to their milk. Likewise with meats, hence the advantage of consuming grass fed meats only. How can lectin intake be reduced in diet? As it is impossible to maintain a healthy diet and avoid lectins if you are experiencing symptoms pertaining to lectins the key is reduce intake and increase tolerance. Firstly, even organic and spray free fresh fruit and vegetables contain lectins, but if they’re not engineered they should contain less. Grass-fed meats and dairy is the best way forward for proteins to reduce lectin intake. How can tolerance to lectins be improved? There is no definitive answer to improving the individual’s lectin tolerance, however there is some key things you can do. Have good healthy nutrient intake particularly zinc. The herb ginger is particularly high in zinc and is very good at reducing inflammation and calming and supporting function all along the digestive track. Having said that, if there is any history of stomach ulcers please consult your local herbalist or naturopath for advice. How can Kinesiology help improve tolerance to lectins? Kinesiology is a way to ask your body what is stressing it by what we call indicator muscles. It is largely based on Traditional Chinese Medicine meridian system and acupuncture points which are like reference points. Via assessing where the stress is the body can also indicate how to relieve the stress, thus reducing the symptoms one is experiencing. Therefore kinesiology balancing is a remarkable way to reduce symptoms. What about Acupuncture and Chi Nei Tsang Abdominal Massage? Also great ways to increase the energy to the gut, reduce stress and increase energy. Chi Nei Tsang Abdominal Massage is nearly an hour on your gut – it helps to break down the scar tissue that has built up around the abdomen due to years of food-abuse that’s destroyed the villi – let the healing begin!!! Health issues and don’t know why? Is it leaky gut?! So… kids cough mixtures, anti-biotics, pain killers… how do these affect the HEALTH of our children? Antibiotics: obviously these are useful for bacterial infections. Antibiotics should not be used in viral infections (fevers, aches and pains) and only work for a specific type of bacteria… so many anti-biotics aren’t prescribed correctly since Doctors can’t possibly know when you walk into their surgery whether you have a bacterial, viral or fungal infection. Ironically by giving an antibiotic we are reducing our immunity for fungal and viral infections, so while on antibiotics we may actually get other infections while we are not looking! Cough-suppressants/Puffers: literally they suppress a cough. No surprise. What people often don’t understand is the way it happens – the mucus is suppressed to the lower lobes of the lungs, which over a long period of time turns into hardened, plaque-like mucus and we end up with less and less lung capacity. Long-term: asthma? emphysema? Studies are yet to be done. Ritilan and dexamphetamine medications: for ADHD and other attention problems. Ritilan is in the same group of drugs as cocaine. Any side-effects of long-term use of cocaine is possible with ritilan… and some children may have issues with not being able to sleep, weight loss, anger issues… There are cases of long term use of drugs like Ritilan and the brain, in some people, doesn’t regenerate as fast while taking it and starts to deteriorate. There is some thinking that long term ritilan use may cause dementia. such as killing cancer cells – this is an inflammatory process! killing viruses and bacterial – these are inflammatory processes! So, by taking a medication that is reducing inflammation in our bodies we may be accidently allowing other nasty things like bacteria or parasites to take hold in our body. Now these are scary Australian Statistics! Released in June 2011. IF the liver doesn’t cope, we don’t release toxins. Toxin build up is indicated. Women stressed during pregnancy – stress makes us acidic, increases adrenalin and can exhaust immunity. This can be a factor. Dodgy gut function – for examply DPP4 enzyme deficiency… this can create opioid effects in kids that can change the function of the brain – anxiety, panic attacks, ADHD, Autism and Aspergers, not to mention normal dyslexic symptoms. Come in and see us. How can we help your child? Everything is treatable. Everything is possible. We just have to be willing to try. Aren’t allergies annoying! They can make the best day the worst in a flash… How do you suffer? Would you feel better getting through hayfever season more easily? Would it be easier if you didn’t need to go to the toilet 10 minutes after eating spices? What about those welts that appear every time you mow? the body being too acidic: there’s a white blood cell (that we find in live blood screenings) that nature has designed to drop acid on half-digested particles that have ended up in the bloodstream. This morning I saw a young, vital man with 21% of eosinophils in his blood (it should be less than 4%), but his only symptoms are tiredness and crankiness… We need to find his untreated, unfound substances that are lowering his body’s energy – they’re probably not allergies, but there’s definitely something going on!! toxicity – the more toxic our body is, the more overloaded our body becomes and the more dysfunctional our detox organs become. Our detox organs are the gut, the immune system, the kidneys and liver, not to mention the skin and the lungs! Give us a call, and start the process!! Food & Chemical Allergies and Sensitivities – we can help!! 2. Supplement testing; Detection & treatment of the offending allergen! Why Detox? Is it really necessary?? Why Detox?? Is detoxification really necessary? If we have ANY health problems, there’s over a 90% chance our inflammation, acidity, toxicity can be helped through detoxing. Many doctors say 100% are caused by toxicity of numerous kinds. Our body’s simply can’t catch up with the amounts of toxins in the environment, and release them all. There are viral and bacterial connections to many chronic health problems, fungal and candida connections to just about every disease. Everything from arthritis to glandular fever, chronic fatigue to hashimotos, asthma to ulcers, has been linked to a gut problem, where these infections find a home base to live – not a good thing! For someone who has allergic symptoms: sneezing, runny nose, sinusitis, rashes, hayfever, itches, often we have stored toxins, which are positively charged and creating inflammation. Everytime our nose runs and our eyes itch, not only are there toxins plaguing our already unhappy body, but we are also storing inflammatory hormones, and often the drugs we use to treat these problems. With aspergers, autism, ADD, ADHD there are links to heavy metals and allergens. There are numerous studies which show high levels of heavy metals in hair mineral analysis, along with large amounts of stress hormones, such as cortisol and adrenalin, running through the system. Nearly all show intolerances to wheat and dairy. The organs of elimination and digestion simply don’t have the capacity to break them down properly. In issues associated with weight loss, it is a well established fact that people who detoxify lose weight faster and don’t reach the hump that others reach. Fat tissue also creates at least 30 inflammatory substances, all of which then need to be stored in the body, often in the fat tissue, once again. With inflammatory conditions such as arthritis and osteoporosis, it is often shown that large amounts of toxins are attached to the bone cells. This creates inflammation and causes degenerations to the area. We also have full detoxification programmes which work through the body organ by organ and take the toxic load out of our systems! Like many useful and unusual products, at present until TGA approval this is the only way to get the product. Make sure you tick the box that says delivery address same as billing address and put Australia ( or your particular country ) at the bottom of your address. Double check your details and click on order. Read the order and make sure you’re your details are correct. Waiora will send you a confirmation email in a few minutes. Allergy testing is something that there’s a lot of controversy about these days. Many naturopathic clinics are being told that they can’t do allergy testing. Weird, huh? It seems to be an issue that the government has taken to heart, that only drugs can effectively treat allergies. So what do we do if we don’t want to use drugs which suppress allergic symptoms such as sinusitis, asthma, hayfever, itchy eyes, itchy skin… not to mention issues such as bloating, burping, belching, wind, flatulence or more debilitating issues such as eczema, dermatitis and psoriasis. Our clinic has fabulous results with allergies and intolerances because we use a variety of testing and treatments. We use live blood analysis to determine how well the immune system is functioning. There are particular signs in the blood that let us know if the body is more likely to be an allergic one or not. We use other blood tests such as candida, helicobacter and celiac testing to find underlying gut issues which predispose us to health problems such as allergies and intolerances. We use urine testing such as urinary indicans and ph testing to find out how much bad gut bacteria we have and how acidic the body is. These can both be linked to poor immunity. Asthma: Natural Strategies to improve your breathing!! Natural strategies for asthma have improved hugely over the last five years. Breathing is such a natural process that it’s hard to imagine the lungs conspiring to stop us…however, it now happens to many, many Australians each year! 2.2 million adults have asthma (1/10) and 1/6 children (the third highest rate of childhood asthma in the world! Around 400 deaths per year are a result of asthma and around 60% of these are fully preventable – even moreso when the lungs and respiratory system are supported with natural therapies… it takes time, but it may save your life! New Leaf Natural Therapies have strategies to help you improve your lungs and take control of your life! reduce allergens and allergic tendencies: the number one reason for asthma attacks – we do treatments to improve allergic tendencies: these include supplements; kinesiology and frequency specific microcurrent. In our live blood analysis testing we usually find massive levels of eosinophils (allergy markers in the bloodstream) in asthmatics. We consistenly find these improve over time with this combination of treatments. repair the gut! We find that just about 100% of our clients with asthma have ‘leaky gut syndrome’ in our Live Blood Analysis. The tissue in the gut (endothelial tissue) is identical to that of the lungs and inflammation tends to happen simultaneously in both areas with affected asthmatics. So ‘leaky lung syndrome’ and ‘leaky gut syndrome‘ go hand in hand! Many chronic coughs are a result of either subclinical asthmatic tendencies or allergies. It is important to get to the bottom of it as these coughs can last for years! Asthmatics tend to have low oxygen levels due to inefficient lungs: increasing substances like co-enzyme Q10 and oxygen supplements help the body to re-oxygenate.